AN INVESTIGATION has been launched against a convicted criminal who called on a crowd to be ready to take up arms and defend President Recep Tayyip Erdogan. The office of the Chief Public Prosecutor in Anadolu yesterday started an investigation against Sedat Peker, who called on members of the public to take up arms against opposition parties. The Prosecutor office said a statement an investigation has been launched against Peker in order to investigate the truth of the matter, in the scope of Article 160 of the Code of Criminal Procedure No. 5271. Peker’s speech was made as the March elections approach where the governing Justice and Development Party (AK Party) is expected to face fierce contestation from various opposition parties. 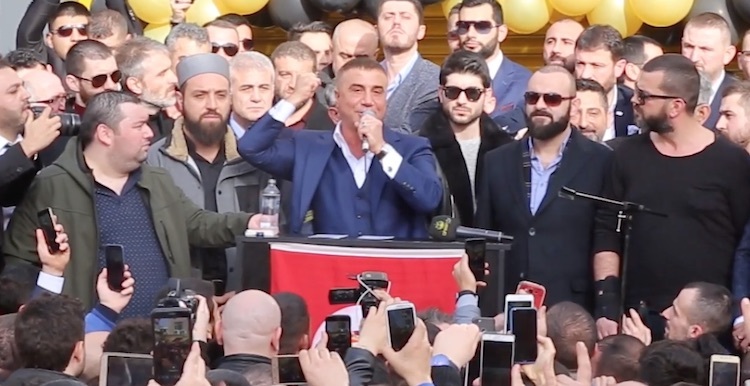 Peker, notoriously known as an Erdogan loyalist, has called on Turkey’s citizens to rally behind the AK Party’s people’s alliance with the Nationalist Movement Party (MHP). Ultra-nationalist Peker (47) was sentenced to 14 years and 5 months in jail in 2007 within the scope of the “Kelebek Operation”. The Mafia leader was transferred to Silivri L-Type Closed Prison to participate in the hearings of “Ergenekon”, the high-profile trial of 275 secularist and military people accused of plotting against the government. He was released in 2014, as the law amendment evacuates the detainees, which had completed five years. Since his release, Peker has a long track record of openly threatening Erdogan’s critics and opposition parties. A lunatic Peker had shouted at the academics during a rally protesting terrorism in Rize province in 2016.